Meet Remi Eriksen, a long-time employee with DNV with a great interest in technology who now has the responsibility of being Group President and Chief Executive Officer of DNV GL. We talk about what a Classification Society is, how they work and where Remi thinks they can make a difference. We go into digitalisation, power systems, electrification of short sea shipping, batteries, hybrids, LNG, alternative fuel and new material such as composite, but we also discuss safety at sea. We talk about the fact that in the future, shipping will have the need to recruit people with other sets of skills that what we traditionally have done and we discuss “thought leadership” in the maritime community. 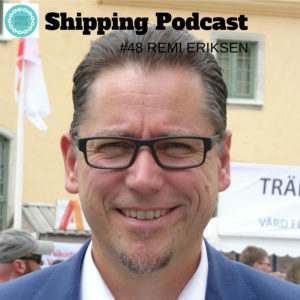 Listen to this episode and comment on what you hear, we need to get the discussion going in order to develop ourselves and the shipping industry. You are welcome to comment below, or if you prefer social media, we are on Facebook, Twitter and Instagram. See you there! And thank you for listening! Have a wonderful Christmas!